Due to its massive size, tackling Pompeii on your own can be very tricky, even if you have a map. 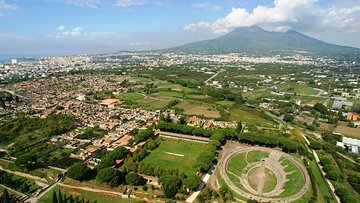 This Pompeii archaeological site walking tour is led by a guide who knows the grounds well so you won’t get lost. Plus, your guide knows the fastest ways to see the most important areas and tells you historical facts as you walk. Having heard that there were very few information signs, we were told it was best to take a tour. To be honest, I would have rather had an audioguide or just done some research ahead of time to see what we most wanted to see. Luckily, when the tour was over we were able to explore some more. The tour was fine but there were quite a few people (~30?) and it was slow moving. However, the tour guide was knowledgeable and the tour is cheap so we didn't feel like we had wasted money. We really enjoyed this tour! Our guide was very knowledgeable and relatively easy to understand, and he adjusted the tour in the inappropriate spots to not offend children on the tour. The company was very accommodating, after I'd inadvertently booked the tour for the wrong day. They made it very easy to change. Highly recommend! Didn't get there on time because the street directions are close to impossible to follow. The signage is almost non-existent and we ended up following parking signs that had us a 20 minute walk away. We finally were directed to the main entrance but I don't know where I would have actually parked. So much to see and could only take in a fraction of Pompeii and its wonders in the time we had. Good incentive to plan on returning! Using a tour guide is the only way to learn about the history of Pompeii. The guide also pointed out interesting items that we would have just passed by ! Recommendation: After the tour get something to eat at the resturant near the center court yard. They also have bathrooms there. I highly recommend that you spend a couple of more hours wandering the city. A lot to see ! This tour was great. The guide was friendly and informative but didn't talk TOO much. He was funny without trying too hard and he didn't sound too rehearsed. There were no headsets but we could always clearly hear him as the tour wasn't too big. The tour definitely added to the experience of our day trip to Pompeii! Would highly recommend. We enjoyed every minute of this tour. Thank you. This was a good tour - probably would have liked a smaller group but our guide was very good.